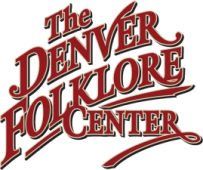 Danny Barnes is the 2016 Steve Martin award winner for banjo excellence and has been a fixture of the bluegrass festival circuit for a few decades now. 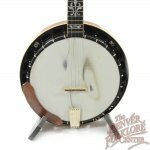 A number of years ago respected banjo builder Rob Bishline and banjo virtuoso Danny Barnes teamed up together to design this beautiful, short scale, light weight, and sweetly mellow sounding banjo. 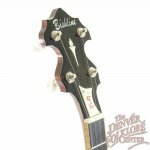 This used Bishline Danny Barnes model is built with Sinker wood Mahogany for the neck and resonator. 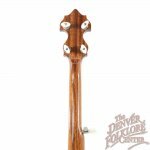 For those unfamiliar, Sinker Wood is a term for wood that is reclaimed from the bottom of a river or lake and is highly desired for its looks, stability, and tonal complexity. 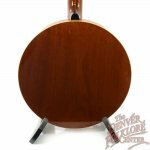 In addition to the sinker wood mahogany neck and resonator, legendary banjo rim craftsman Tony Pass constructed this banjos rim out of sinker wood birch - using the block rim building style he is well known for. 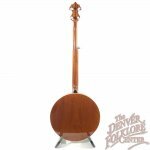 A custom wooden tone-ring pairs with the previously mentioned short scale to produce a mellow tone and undeniably lightweight resonator banjo. 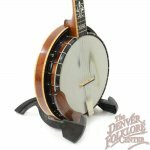 An additional cosmetic piece is that the tension hoop and flange are powder-coated black - making for one outstanding looking banjo. 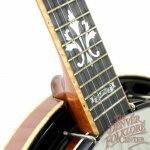 We are told that Bishline, Barnes, and LR Baggs worked together to make the pickup for this instrument that sounds good at even the highest volumes and can attest that it is one good sounding banjo pickup. 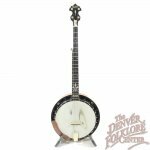 The condition of this used Danny Barnes Banjo is excellent and only some light scratching and a few small dings mar the resonator. 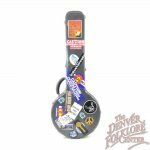 Also included with this instrument is a nice fiberglass hardshell banjo case.